A reflection for the 6th Sunday in Ordinary Time, Year B. The readings are Leviticus 13:1-2, 44-46; Psalm 32; Corinthians 10:31–11:1 and Mark 1:40-45. “If you want, you can make me clean” says the man. “I do want” Jesus says to the man. “I do.” I’ve always found that short exchange to be very moving. This year I have noticed in particular how in the Gospel of Mark, Jesus heals people. He heals a lot of people – so far he’s already expelled a demon from a man in the synagogue and healed Simon’s mother-in-law – and we’re still in chapter one! Most moving is that he heals people by touching them. It’s good to be reminded of these stories, to read them and hear them because they are our story. Jesus was walking down the street one day, when he heard a blind man cry out his name. So Jesus came out from the crowd and he asked the man, “Why do you shout so loud?” And the blind man said, “Oh Lord, I want to see” and Jesus touched his eyes and set him free. Once he was teaching in the synagogue when a man shouted, “you are the son of God! Have you come here to have us destroyed?” “Be silent. Leave him,” Jesus said in a loud voice. And immediately the demon left the man and all were amazed even demons obeyed his commands. And today, a leper came to him begging on one knee. He said, “I know, if you want, you can make me clean.” “I do want” Jesus said to the man. And with pity, he touched his hand. 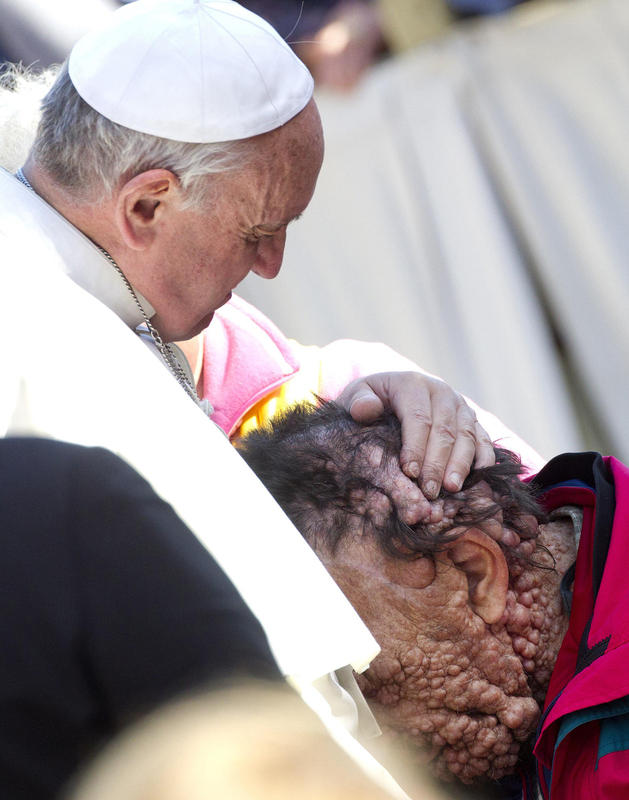 And all at once, the leprosy was gone and he went away praising God and telling everyone. Who are you Jesus? Who are you? To bring good news to the poor and to set prisoners free; to comfort the afflicted and to help the blind man see? Oh Lord, would you do the same for me? I need to be free from my needs. I need to be free from my pain. Oh Lord, I need my emptiness filled. I need to live again. Today Jesus wants to heal you. Jesus wants to set you free. Will you let him? This Valentine’s Day weekend, Jesus wants to fill you with His Love. This Family Day weekend, Jesus wants to restore you to his family; Jesus wants to bring you back into Communion. Will you let him? Today when all we hear in the news is about consent (and 50 Shades of Grey) and when the issue of assisted death is at the forefront – when human beings are saying “I want to do what I want.” And we think that having control over our own bodies is freedom. This Carnival weekend, when many are giving away to “freedom” and excess; today, Jesus wants to set you free. Truly free. On an interview Pope Francis did for America Magazine in 2013, he was asked, “Who is Jorge Mario Bergoglio?” The Pope thought for a bit and then responded, “I am a sinner. I am a sinner whom the Lord has looked upon.” That’s who we are: sinners in need of healing. But that’s only half the story – that’s what Lent is about; but Lent leads to Easter! We are sinners whom Christ has looked upon and today Christ looks upon us; He touches us. That is the Eucharist: Jesus touching us. That is Christianity: God becomes a human being, so He can touch us. If religion is man’s search for God; Christianity is God’s search for man. And Catholicism is the religion of touch – we sit, we stand, we kneel, we smell the incense and we kiss the crucifix. We listen to the music and sing the songs. We light the candles and we blow out the candles. We give each other the sign of peace. We go and proclaim the Good News. We confess our sins out loud and we hear the words from the priest, “I absolve you from your sins.” And we celebrate the Sacraments: We bathe the body with the waters of Baptism, we anoint the body with oil; husband and wife become one flesh; we eat the Body and drink the Blood of Christ.